Following "Dawn of an Era", "Once in a lifetime" was Never Known's second release. Recorded between August 1994 and August 1995, it was published by Murder Release as a C46 tape in September 1995. The tape was subsequently re-released on CD-R by Afe in March 1999. For this new edition, all tracks were remastered from the original tapes by the author in March 2007 at Lips Vago Digital Studio. The album consists of ten short ambient numbers mostly created with poor equipment which included several tape recorders, cheap microphones and objects. Basic synthesizers lines were subsequently added to some of the tracks. "Another Friendly Edition" is the classy little CD-R label founded and run by Andrea Marutti. Today Marutti is an established and admired ambient artist, but he has a long history of experimenting with genres stretching back to the early nineties and releasing (mostly solo) material under a variety of pseudonyms, including Never Known. Several years ago he founded Afe to showcase - in handsome rectangular cardboard sleeves - a roster of singular works by singular artists generally filed under the category "ambient". In April 2007 he reissued his own sophomore effort, "Once In a Lifetime", recorded thirteen years earlier. Remastering music Marutti claims was made with "poor equipment, which included several tape recorders, cheap microphones and objects", he also freshened things up a bit by adding a few sythesizer brush strokes. The music on "Once In a Lifetime" is darkish, in the sense of "primitive" - it seems like we're in a place where many taboos circumscribe existence. These tracks are sketches, grand vistas indeed, but of regions you really ought not to be in. Some of these sketches are more filled-in and detailed, like "Through the Gate", out of whose haze of drone emerges a soft, distant tribal chant with powerful suggestive force. This is clearly ambient of an early vintage - Enovian, one might call it, recalling the low-key but high impact work Brian Eno created on albums like "Apollo" and "Music for Films" - big on ideas and low on ostentation. It takes you somewhere utterly foreign and new. 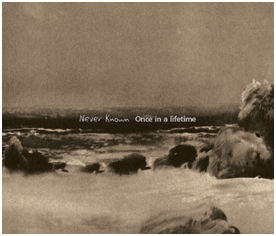 "Once in a Lifetime" is the second Never Known album, recently re-issued on Afe Records (Andrea Marutti's own label). This album consists of dreamily-ritual excursions through ancient time and primordial elements. It starts with the two trancey-minimalism drones ("A Waiting" and "Through the Gate"), introducing us to liminal spaces. "Day Two" represents the beginning of a voyage through the origins and the primal-ontological foundations of life. It is made of expanded organic chords floating in deep distance. Almost without transition it directly carries on the completely sonic-black mental-scape with its strange metallic "doomy-like" echoes and high-pitch fantom-like frequencies. From dark austerity it passes to a beatific state of ravishement with the intimate and dreamy "On the Beach". This album is in the vein of the previous Never Known, continuously beautiful with intensively mythical tellurian symbols.